Making a fresh herb wreath is easy and very fragrant. 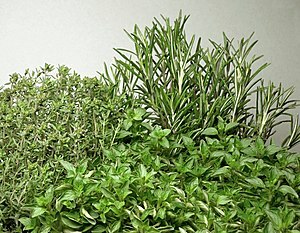 I love fresh herbs which is why I grow them, lots of them. If you don’t grow them now, consider starting a herb garden. It will save you a ton of money, you will always have fresh herbs on hand and you can have enough to make things like this. So grow yourself a money-saving herb garden. You will be dizzy with how great this smells! Cover your work space with paper to catch all the leaves that she during the wiring process. Lay the wreath form on the paper and start attaching bundles of herbs to the frame. For this wreath I used fresh Thyme and Rosemary. Overlapping the ends of the herbs, fill the frame all the way around. 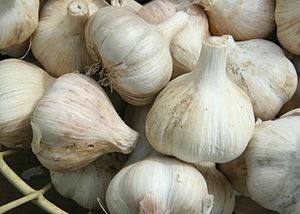 With a skewer, pierce a hole through the bottom of the garlic and shallots. Thread a floral wire through the hold and attach the garlic and shallots to the herb frame. Tie a ribbon and hang. I made a small wire loop on the back of floral wire for the hanger. The herbs will dry. You can use this in cooking if you like, but I am only using it for decoration this year. This entry was posted in basic skills and tagged Christmas, christmas wreath, diy, Garlic, Herb, herbal wreaths, Rosemary, Shopping, Thyme, Wire, Wreath. Bookmark the permalink.